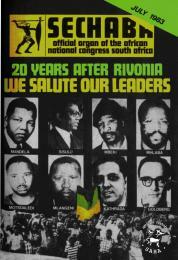 Description: This is a cover of the July 1983 issue of the journal Sechaba: official organ of the African National Congress with photographs of some of the Rivonia trialists. The cover is reproduced in black and white on page 90 of Julie Frederikse's book 'The Unbreakable Thread: non-racialism in South Africa' originally published by Ravan Press in 1990. 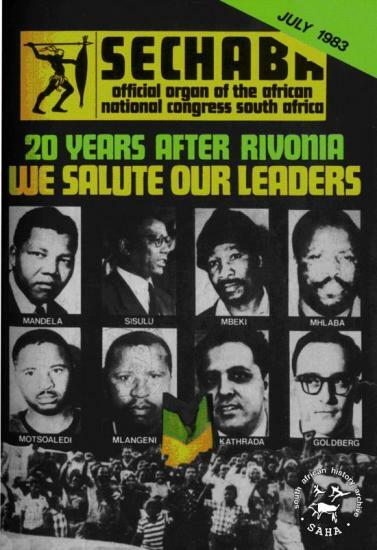 Included in SAHA's online edition of the book and in the virtual exhibition 'Tracing the unbreakable thread: non-racialism in South Africa'.